Paint stripping removes layers of paint to reveal the beauty of wood that can be hidden under paint. This is especially used for wood in interior rooms which are either exotic or have a historic value. The process will depend on the type of wood and the paint or finish to be removed. Most can be removed with off the shelf products, but make sure to stay safe while using those strippers, since they can include dangerous chemicals. You should have ventilation while striping paint. The chemicals can produce powerful fumes, and the old oil paint, which the stripping removes, creates even more noxious fumes. If possible work outside and in the shade. The shade is very beneficial to you and the stripper, and will allow you to breathe easy. If you are working inside, for instance when the wood cannot be removed, open up the windows and use fans to ventilate the room. In the winter, you will have to wear a respirator to protect yourself. Serious brain damage and death may occur if you don’t. Stripping paint off wood is a messy job plus chemical strippers aren’t selective about what they strip. Wear clothing that will protect you from chemical burns and chemically resistant gloves. Paint strippers can cause nasty chemical burns. Protective goggles are also a wise investment. They will help keep your eyes safe during paint stripping. If working indoors, cover floors with heavy plastic or a butyl coated drop cloth. Cover furniture with lightweight plastic. If you are working outside, you should still work over drop cloths and protect adjacent surfaces. You usually don’t want these chemicals washing off into the street or into your plantings. Drop clothes also keep you from unintentionally stripping paint off other surfaces. Fumes from most paint strippers are highly flammable. To avoid igniting the wood that you are stripping, wait until later for a cigarette break. Extinguish all open flames as well. Pilot lights and halogen lamps can also create fires, so turn these off if your paint stripping area is near either of these sources of ignition. Paint and finish that you remove during paint stripping should be put into a metal can and allowed to dry. Only when the finish is completely dry should the can go into the trash. Rags used in the process should be soaked in a pail of water before being disposed of. A metal can with a lid may also be used. If a recycling facility is available in your area, take the rags and empty stripper cans to the recycler. Paint stripping may seem complicated with all these requirements. Actually, it isn’t complicated. Yet, it isn’t a job for the fainthearted. The finished results can be so rewarding that refinishing the wood in your home is worth it. 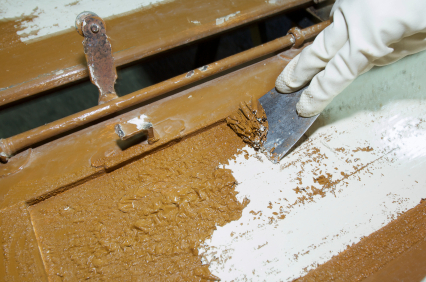 The cost savings over replacement is just one reason to refinish. The inability to replace the wood in your home with as a good a quality is another very good reason to refinish your existing wood trim, cabinets and doors.